Through my writing business, The Word Barber, I was hired in 2018 to write product copy for 300 items for their April launch. 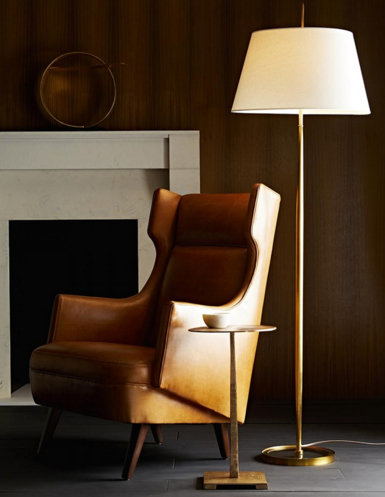 A wingman for the ultimate evening at home, this handsome armchair will become a favorite seat in the house. Ease into the slight incline and you’ll never want to get out—with the comfort of plush cushioning at all angles, you’ll be settled in for the night. It even has looks to boot; unique modern lines, pipe detail and tapered wood legs give this chair class and style. Also comes in snow bouclé (8090) and muslin (8092). Brilliant not only due to its illuminating powers, but also its bright aquatic hue, here is a lamp with personality and zest. The reactive glaze finish covers every rib and taper, so it has texture to the touch and to the eye. Crafted from porcelain with rich details. Topped with a tapered barrel shade in white linen with cotton lining and contrasting brushed nickel ball finial. Glaze finish may vary. I worked with a client in the summer of 2017 who was looking to update their website. Though we didn't end up using this copy, I really loved the voice and thought separating the specs from the story was a better experience for the customer. Each brushed yellow gold pendant dances with seven round diamonds, handmade in a wavy, oblong shape. The unique dangle hangs from a French wire hook that’s touched with an added round diamond. Details: Handmade in 18k yellow gold, French wire hook; 16 diamonds 0.67 ctw, F–G color, VS clarity. We consider this magnificent piece the pièce de résistance of our collection. An incredibly rare golden South Sea Keshi pearl has been hand-selected for this beauty, nestled in the center of a handcrafted, brushed gold scalloped pendant. Adding to its undeniable elegance are 45 round diamonds, set in nine rows that lead the eye directly to the centerpiece. Chain not included. Add your own chain or let us help you pick something from our collection. Details: Handcrafted 18k yellow gold; 45 diamonds 1.47 ctw, D–F color, VS clarity; One Golden South Sea Keshi pearl 11.5mm, organic. Phulkari is an embroidery technique that was used on the cloth you see here, and means "flower working". Such vibrantly hand-sewn pieces would be used to celebrate a momentous event in a woman's life, like a wedding, the passing of a loved one, or childbirth. Each color of silk was thought to possess attributes that would guide her and her family to prosperity. This piece is quite rare with a bright green trim that lines the edges, something uncommon in cloths of this vintage. Can agate you a drink? Of quartz! Do away with chintzy coasters and upgrade with something beautiful. These natural agate coasters are a sophisticated place for your beverage of choice, not distracting to your lovely side or coffee table. Each coaster will be unique in color, grain, and shape, a nice bit of added texture and personality when you entertain. Actually, as it turns out, it's pretty easy being green. At least when you're weathered with an elegant patina. This iron table is ideal for a patio or sunny room, either set up for potting your plants or paired with a couple chairs as a conversation space. Keep in mind though, that while the green finish makes it charming, it doesn't protect it from the weather. We recommend it be used in a covered space. 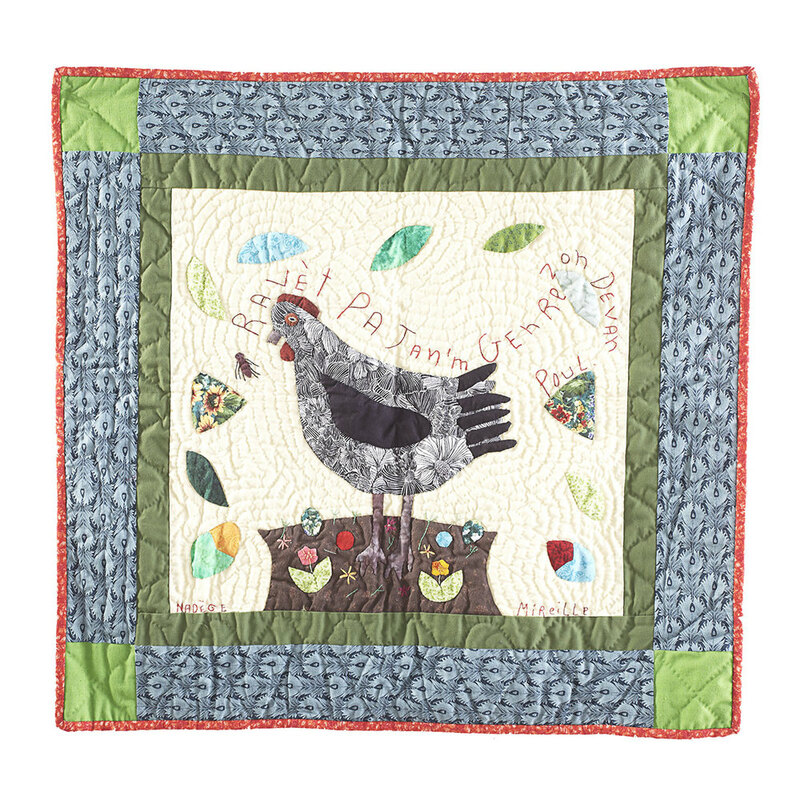 The hand-stitched quip, "Cockroaches don't stand a chance with my chicken around" seems symbolic of how something so bright and cheery can come from a place of gloom. Here's a quilt made by a cooperative of women, deep in the heart of Haiti, working to remedy the economic plight of their community. Just a glimpse into their daily life proves their appreciation for art on anything from vibrantly painted taxis and buses to colorful storefront murals. It's the perfect example of how, even with the widespread poverty and disease afflicting the Haiti, her people still have a way of seeing artistic beauty in their surroundings. Crafted with a dowel casing to fit a dowel up to a half-inch in diameter. On the back you'll find a patch embroidered with the title of the quilt, its production number, the dates it was made, and the name of the quilter who made it. Cabinets overflowing with bowls and blenders? This impressive, six-shelf, beech and elm rack is an elegant solution for all your storage woes. Place heavier items like stand mixers at the bottom, color-block your cookbooks, and use baskets (try our Seagrass Storage Baskets) to store miscellaneous items. Now, just one thing is missing: that fancy new appliance you've had your eye on. Go ahead—you've got plenty of room. Need a place to fit your TV? Remove the shelves and you can fit a 54" screen inside. Natural variations in wood color and grain mean each one is a little different.